Last week, I was asked to appear on MSNBC’s Andrea Mitchell Reports to discuss my concerns with an NRA web video that compares school security to the protection requirements of the president’s daughters. The widespread outcry over the ad may have prompted even some at the NRA to question the judgment of running it. As small a step as this may seem, there appears to be growing sentiment that it is inappropriate for people – on either side of this issue – to involve any children in this debate. I LOVE THIS Susan !!!!!!!!!!!!!!!!!!!!!!!!!! Yes, this issue is a tough call…BUT…Certainly, It was WAY OUT OF LINE !!! Thanks again for sharing insight from a very unique perspective that others never get to see or rarely even think about…especially the facts of the protection being there and then it’s gone…Great talking points in the interview…and, absolutely so TRUE !!! The NRA hs no honor. 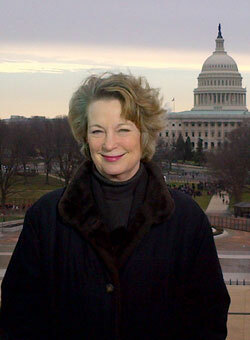 Great interview with Andrea Mitchell By Ms. Susan Eisenhower on The NRA web ad using the POTUS minor children. Couldn’t have been a better and more honest rebuke of the NRA’s irresponsible comparison who needs “equal protection” under the gun. An old statement not often totally applicable, but is with the NRA ad,”have you no decency”. Thank you for also sharing your personal experience. However appropriately or not, gun control is like abortion in that it is a deeply entrenched bellwether sociomoral issue in America that reliably defines and separates two equally agenda driven factions. The only significant difference, of course, is that misused guns kill a few thousand albeit precious live human young Americans (mostly inner-city gang related ‘children’ defined by anti-2A zealots as “under 18”, in drug related turf wars) per year in America, while abortion kills over a million live human young a year in America alone on an industrial scale of moral and human rights atrocity. The prevailing ‘moral’ theme here, thus, seems to be that if the ‘kid’ victims are suburban white grammar school students and killed at once it’s an atrocity demanding great pontification and “action!”, but if they’re ghetto blacks killed in far greater numbers annually all over America, or better yet are fetally out of sight and mind in wombs, it’s apparently business as usual, relative scale disparities notwithstanding. OK, OK, so there’s one other difference: no tax money is extorted from working Anericans to help fund the commercial extermination of live, human fetal kids (with the same human and civil rights as the rest of us, 53% of whom are nascent women) … by gun. These third-rail, bellwether sociomoral issues bring with them the widely reviled camps of the NRA and Planned Parenthood. Both are considered by their enemies as wholesale reckless exterminators of the innocent for commercial gain and pseudo civil rights theater. The NRA says gun abuse victims in little white coffins are the price of Second Amendment protected freedom, while PP says the million+ kids a year in the orange med waste bags are the price of “a woman’s right to choose”. Both groups piously proclaim their positions are inherently beyond question. Both groups wave the flag and declare they are defending an inviolable constitutional right (despite the inconvenient reality that, while there is a constitutional amendment specifically guaranteeing the right to bear arms for defense, there is no such constitutional ‘right’ to violate the civil and human rights of live, fetal humans in the most terminal way). Any and all ‘ads’ by either the NRA or PP will invariably be defined as “disgusting”, “inappropriate”, and “misleading” by opposing camps reflexively and wholly irrespective of objective reason, logic or merit. Hence, mere blind political bigotry does not a reasonable case against the ads of either group make. Excellent, as always. And thanks for speaking out. Gun control is an issue of public safety (I have the right to bear arms? Well then I’m ordering up everything the Defense Department has in their catalog. It’s for me to protect myself against my government, right? Isn’t that the claim?). Guns were invented to kill, so in the interest of public safety, they need to be regulated. No one wants to take guns away, just control them as currently varying state laws are a universal joke. All of the areas that already have strict gun control within their limits? You just have to go 10-30 minutes away outside their limits to get whatever you want, no questions asked, no names exchanged, and obviously no background check, just have the cash, baby! Gun shows are candy stores in this regard. How are you going to ever get guns out of the ghetto if they are so uncontrolled right outside their borders? This ad by the NRA is NOT about abortion, so your comparing them is a fallacious argument. In that regard, science and the overall medical profession maintain that life does not begin at conception (can it survive on it’s own? No!). Here’s a thought, William – there are millions of post-birth children that are alive (and BREATHING) that need attention, food, care, love, an education, a home. Crusade for them! Alleviate all suffering of post-birth children. Then maybe, once we know every living, BREATHING child is cared for, you can organize a group that will sign on to adopt any and all children that a mother intends to abort, convincing her to keep it to term and your group has the newborn alive and in your care for until adulthood. The day I don’t see or hear about another cold, starving, uncared for child in this country of any color, race, or creed, is the day your crusade may have one iota of traction. The worst of NRA followers thoughts and intentions are exhibited in this ad – Anti-Mom’s individual rights before birth and pro-shooter’s individual rights after birth. The issue is reasonable public policy for safety. We can sustain gun ownership choice. The constitution has no rule against reasonable regulation – licensing, registration, and post-ownership controls for public safety of gun owners and student’s alike. The examples of NRA failures to police itself and its membership are legion. Does the NRA, for one moment, believe that “law-abiding” gun owners/sellers don’t “occasionally” slip-up and sell (or fail to secure) guns that end-up in the hands of evil doers? We can increase public safety regardless of NRA views of whether criminals will comply with reasonable safety controls even if we have to mutually exclude the NRA miscreants from discourse on public policy and leave them on a rhetorical trash-heap of their own creation..
Susan, well done/KUDOS as always! This “gun thing” drives me crazy! How a “fringe element” ie. NRA has so much $$$$/political sway totally escapes me in America, because this IS NOT Colombia, Somalia or the Horn of Africa. GUN VIOLENCE is a MAJOR PUBLIC HEALTH ISSUE above ALL ELSE!! This “2nd Amendment” BS is a “straw-man” argument & has no real constitutional relevance in 21st century parlance. If you want to own a musket & join the Pennsylvania militia against Federal tyrany you’re probably “protected”. AR-15’s w/30round clips, I’m not quite so sure.We will always be judged as a culture by how we treat/protect the welfare of our children At any rate, when the American populace CARES more about shooting our GUNS than protecting our KIDS, the American experiment of Democracy is most assuredly very THREATENED!! Thanks for speaking out clearly. This is the first time I’ve read your blog but it won’t be the last. Thanks to S. T. on fb.